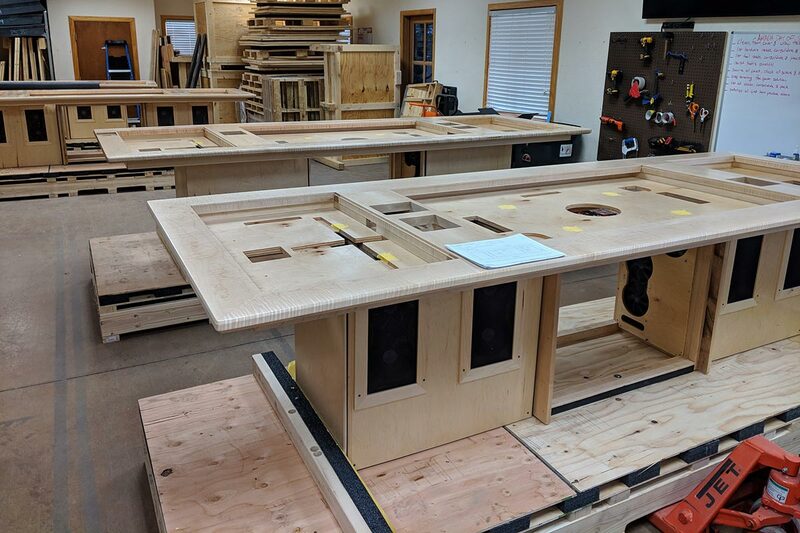 Updated: 2/13/19 - We've added a new microsite, Touch Conference Table which has more information including common questions about custom touch tables. If you were designing the ultimate conference room table, what would it be like? First, such a table would need to be maximally useful for all kinds of meetings and presentations. It would have lots of state-of-the-art embedded technology, multitouch screens, places to charge laptops and phones, and ways to switch display sources to a large video wall in the same room. But it would also have beautiful wood and workmanship. This dream table is what we were asked to design and build for Amada, a Japanese manufacturer of metal processing equipment. In fact, we’ve just built and installed four of them along with large video walls for their showroom just outside of Chicago. Each one of these custom conference room tables is made of quilted maple, which we milled and joined in Ideum’s Exhibit Fabrication Studio. The surface of quilted maple looks almost like ripples on the water; the signature wavy, “quilted” pattern is found in only in the Western Big Leaf species of maple. Two 43” 4K Ultra HD multitouch displays are embedded at the ends of the table top, and a larger 65” HD display is mounted at center. These are all from our Inline series of displays designed specifically to fit into custom furniture and cabinetry. Inline displays use LG commercial 4K displays and 3M touch technology. For smooth and reliable display of complex graphics and video, each display has its own custom PC, and there is also an integrated BrightSign player for playing an introductory video. A Crestron panel and system allows those around the table to automatically switch the source from the table to display images on vivid 3x3 LG video wall. The basic idea behind the table is that the 43” touch displays at each end allow Amada staff to share brief presentations or technical details which could be switched in real time to display on the large video wall. 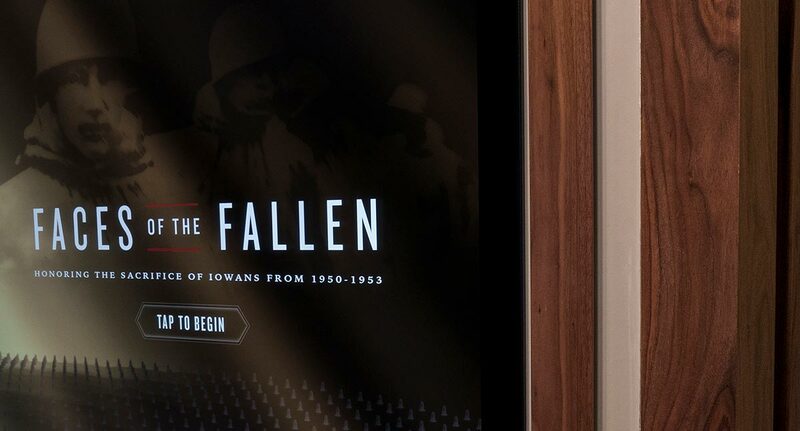 The 65” touch display in the center is a collaborative workspace, allowing visitors to mark up documents used in the presentation or highlight spec sheets and other technical information about Amada products. 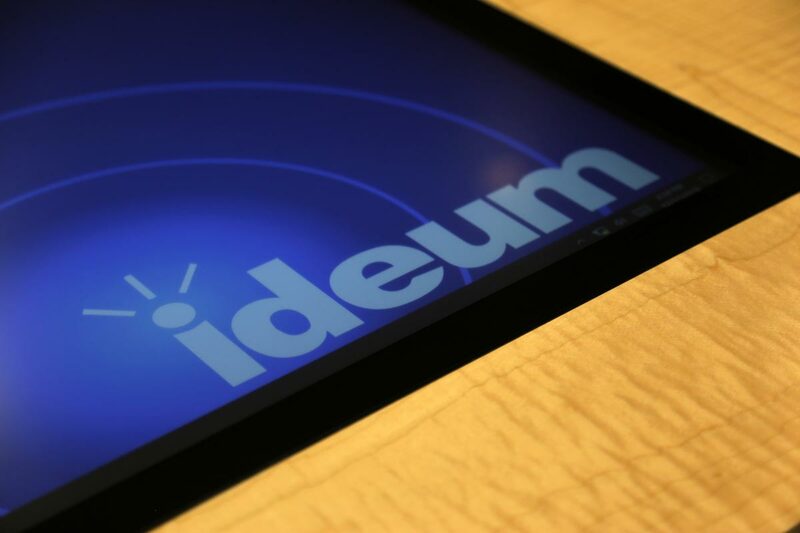 In addition to designing and building the tables themselves, Ideum developed a new markup utility that allows sales staff and clients to annotate documents and save screenshots from presentations or materials. This project involved people from nearly every group at Ideum: our Industrial Design group, the Hardware Workshop where we build our multitouch displays, our Exhibit Fabrication Studio where we do fine woodworking, and our Media Systems group, which, among other things, does Crestron programming and video wall installations. And our Creative Services group designed the custom software for the project as well. 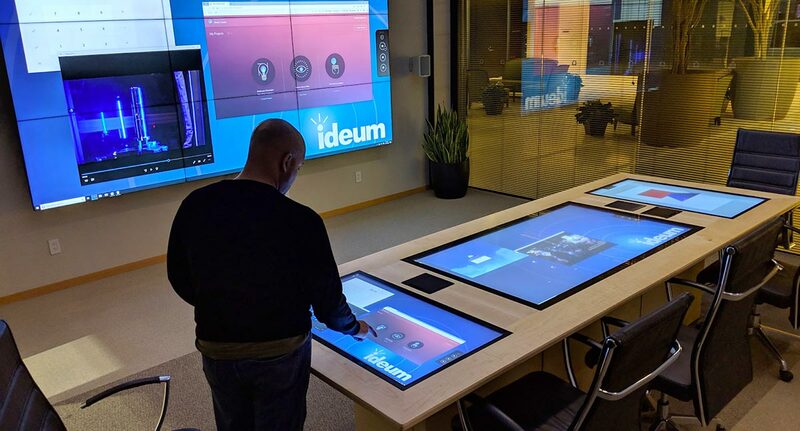 Designing and building these powerful, flexible, and beautiful workspace tables represents an exciting and innovative milestone for Ideum. 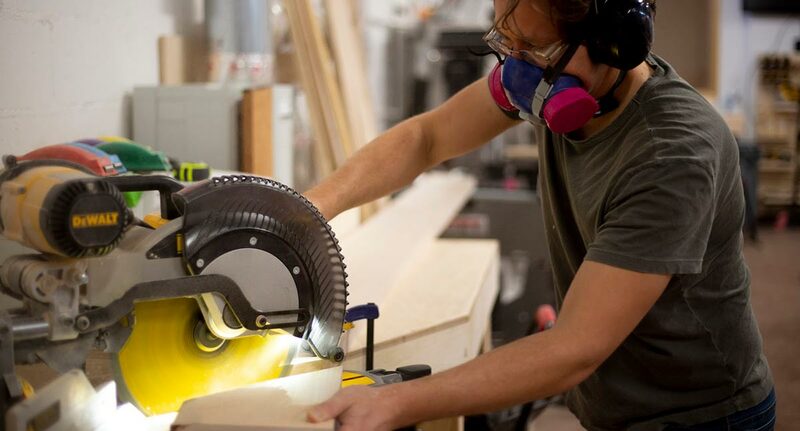 We are looking forward to challenging new projects that mesh fine woodworking with advanced technology! Our Inline displays were embedded into the conference room table. The custom table was crafted out of quilted maple in our fabrication studio.